Vacation rentals software from Estar Booking solutions. The cloud server application, you can use wherever you are connected. Estar group provides cloud software solutions, for Vacation Rentals management. The frameworks are suitable for Vacation Rentals Agencies and Holiday rentals Networks. 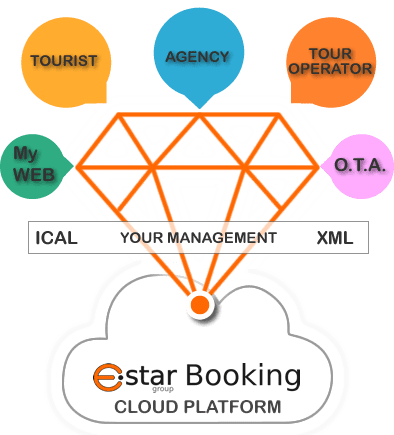 Estar Booking applications permit, via the related Business admin access, to load all the general properties information (descriptions, photos, rules, facilities, etc. ), to set price lists (different price per periods, direct availability, or on request proposals, Agency fees etc. ), to close specific date sets, and to have a direct iCal real time flow (to give it as a real time availability reference, for external portals). Estar B1, Estar Booking Standard / Professional / Enterprise, all versions could be activated starting from 5 properties to an unlimited number. Several add ons are interesting for all those customers that want to obtain the maximum results from the automation, like the Wordpress Template and booking engine (Via XML API), The online check in service, or the Full Agencies 2 WAY XML API.